Today: Alice literally wrote the book on alternative flours, but in this classic three-ingredient berry dessert, she is adamant about using white bread. Just go with it. 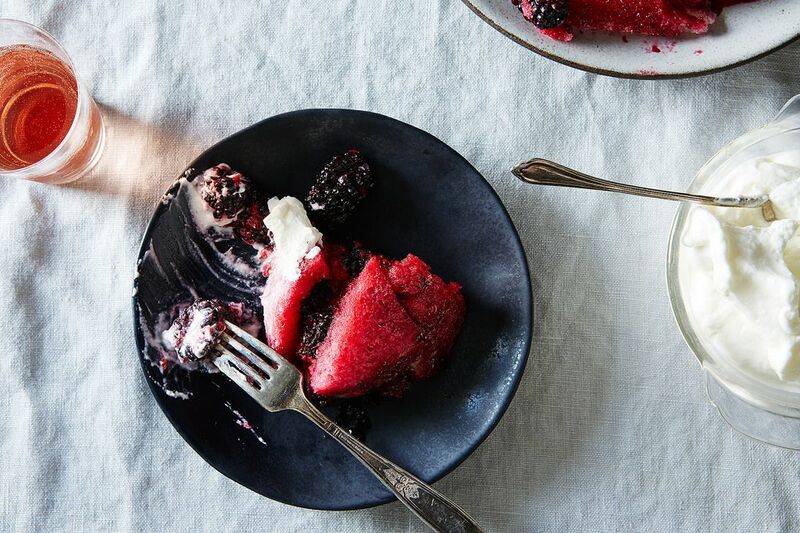 Summer pudding is luscious and juicy and hard to resist—a perfect dish to make when berries are ripe and abundant. If only people would give it a try! I know that the title sounds just fine, so it must be a quick read of the recipe that's the problem. Maybe white bread soaked in sweet berry juices just doesn’t sound yummy. Or maybe (these days) white bread is on your politically suspect list. But stay with me! This seriously good dessert belongs in your repertoire; it’s also ultra-seasonal, easy to make, and quite pretty. Another bonus: It should be made at least 1 and up to 3 days ahead, so there’s never any last minute pressure. This cherished recipe was given to me —dictated actually—by the late Helen Gustafson, once an actress, writer, hostess, and the original tea maven (even before tea sommeliers were a thing…) at Chez Panisse. I may have tasted Helen’s summer pudding for the first time about 20 years ago at one of her intimate tea parties where I also renewed my acquaintance with Julia Child’s sister, Dorothy Cousins. If summer pudding was good enough for Helen and Dorothy, it’s good enough for anyone! 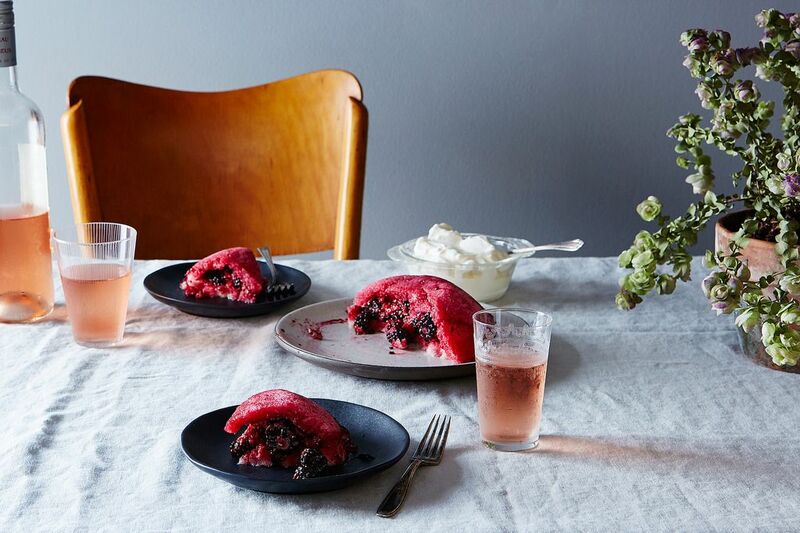 Now that I’ve tempted you to try your first summer pudding, there are just couple things: Don’t even think about substituting whole-wheat for the white bread (because I tried it and it’s just not right, and definitely not delicious). Similarly, cake is not a better idea than the white bread either! Helen served her pudding with lightly sweetened vanilla whipped cream; I serve mine with rose water whipped cream. It’s fantastic either way. Pick up a copy of Alice's James Beard Award-winning book Flavor Flours, which includes nearly 125 recipes—from Double Oatmeal Cookies to Buckwheat Gingerbread—made with wheat flour alternatives like rice flour, oat flour, corn flour, sorghum flour, and teff (not only because they're gluten-free, but for an extra dimension of flavor, too). Thanks for this lovely and light take on bread pudding, which I've been playing around with, but without much success (for my taste buds). Will definitely try this. Might have to pick up your latest cookbook! I just made this summer berry pudding, definitely an easy "genius" recipe. My pudding needed nearly double the bread though - and instead of moistening the bread I used kirsch. Will see how it turns out tomorrow when it has chilled! Helen Gustafson's book, "The Agony of the Leaves," is one of the most delightful pieces of food writing I have ever come across. It's a classic. Alice, my mother makes Summer Pudding at least once every year up in Maine. We always use Pepperidge Farm white bread and just pour cream over the top (too lazy to whip!). I love the simplicity of this dessert!